This recently renovated AAA Five Diamond resort located on 54 acres amidst the 23,000 acre Kapalua Resort, features two championship golf courses and golf academy. Its 463 rooms include spacious one- and two-bedroom residential suites. The resort features new amenities and an expansion to the spa. Guests can enjoy Jean-Michel Cousteau's Ambassadors of the Environment program with a variety of outdoor activities for adults and children. 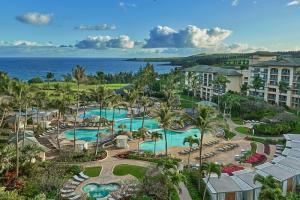 Beachfront in the exclusive Kapalua resort community, 10 miles from Lahaina, 5 miles from Kaanapali. Aina Gourmet, a grab-and-go café features items made from fresh, local ingredients. Enjoy coffee, salads, homemade pastries, fresh juice, a smoothie bar and more. For dinner, the newly designed Terrace features Hawaiian cuisine, with a unique menu created by Executive Chef John Zaner. Volcano Trips, Helicopter Tours, Hana Adventures, Sailing Trips, Luaus, Hike Maui, Golf, Snorkeling, Scuba.